Principal Architect: Ar. 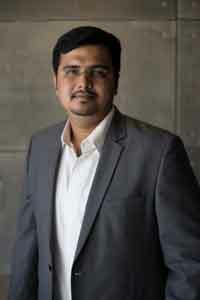 Badrinath Kaleru. Design Team: Ar. Badrinath Kaleru, Ar. Prerna Kaleru, Sanchit Dhiman, Nancy Mittal, Anusha Sharma. - PMC – Surinder Nagpal. - Structure – Continental Foundations. - Electrical and Lighting – The Luminars. - Plumbing – Behra & Associates. - Swimming Pool – A Technologies. 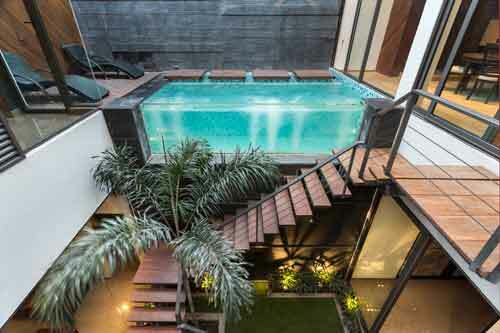 - Pool Glazed Wall – Abhik Mazumdar. - Automations – Ace Automations. - Veneer expertise – Ravi Gupta. 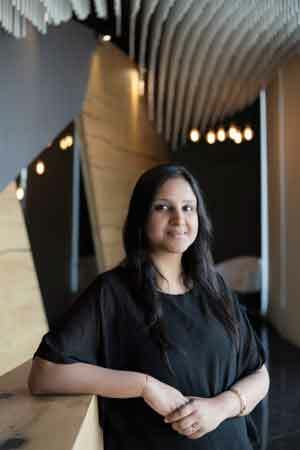 - Kitchen/Wardrobe – Parveen Malhotra. - Flooring: Armani Grey (Stonex India), HARO Wooden Flooring. - Wall Cladding: Washrooms – Italian Stone (Stonex India); Veneer (Natural Veneers); External Wall Cladding – Laminam. - Decorative Light Fixtures: Klove Lighting. - Pool Glazed wall: Reef and Stream Aquascapes. - Furnishings: The Furniture Studio. - Kitchen/Wardrobes: Overseas Alliance (India). Located on a busy road of the city of Panchkula, the Pool House was designed for an elderly couple and their visiting family and friends. The client – Pawan Garg – basically runs his own business of flour mill in the industrial area of Chandigarh. Due to large gathering of his family and friends, he was keen on a one-of-its-kind house. The design brief was to visualize a house exuding comfort, designed for relaxation and leisure. 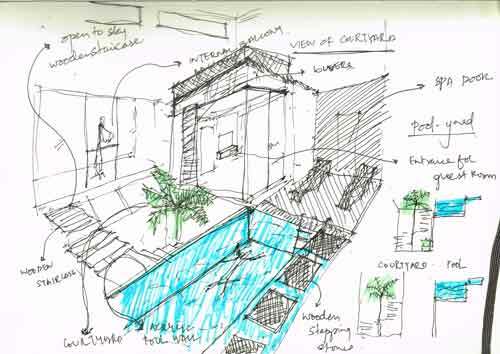 The concept was to place emphasis on the courtyard and pool areas, with these acting as the focal point of the space. The facade has to be designed in two individual masses. In the finished project, a screen comprising of vertical members reduces visual contact with the busy street outside, while allowing the occupants to have a view of the trees lining the road across. Another distinct mass is created by the staircase facade, clad in dark grey textured stone. Small rectangular void have been created in this facade to break the monotonous mass and add lightness to it. These small windows have been fit in with reflective glasses incorporated to add a sculptural dimension to it. A water body planned near the entrance sets a tranquil tone for the interiors. The colour, texture and material palettes of the Pool Yard House have been kept subtle, with use of wood and stone stealing focus. Colourful artwork contrasts against the toned down ambience of the interiors. In general, the lighting is done taking into consideration individual spaces and their function. Quirky light fixtures that draw attention and bind the elements of the space together have been used. Natural light filters in from the double height courtyard, illuminating the spaces inside during the daytime.